The 37th Annual Brantford Rotary Classic Run will take place on Sunday, April 28th, 2019 at the W. Ross Macdonald School in Brantford, Ontario. 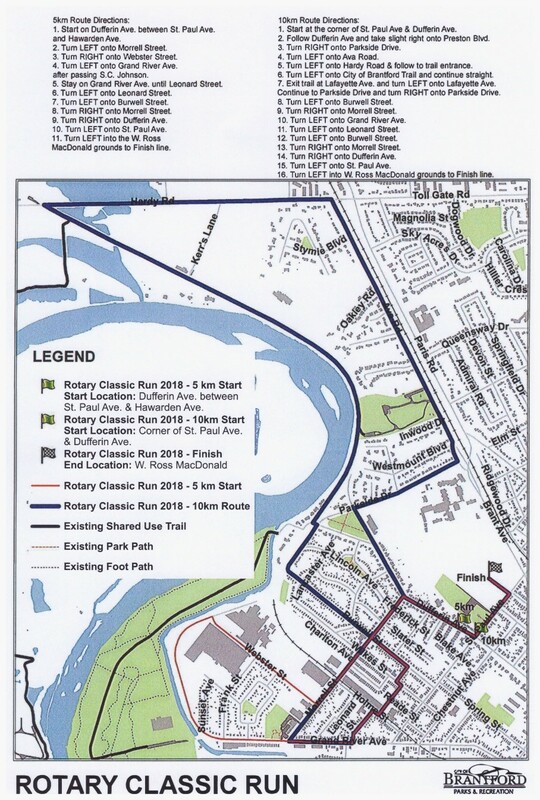 The Brantford Rotary Classic Run is a tradition for many Brantford and Brant County residents as well as residents from surrounding communities. We have taken steps to help facilitate a more professional run atmosphere geared to those who want a record of their achievements. The run has a timed start and finish. A cash prize of $1,000 for first place male and female runners who beat the course records for runner participants. The total of $4,000 available is donated by Millards Chartered Accountants. Medallions for all finishers and Plaques for 1st place finishers in each race will be presented on race day. This event raises funds that support local youth, please take some time to ask friends and family for their support in pledging you in for this race. Funds raised go in part to The Lansdowne Children’s Centre and The Boys and Girls Club of Brantford as well as other projects supporting youth in our community. Remember, YOU RUN, KIDS WIN! Be sure to collect and submit your pledges before race day. Raise $50 or more in pledges and you will receive a Brantford Rotary Classic Run t-shirt! 10km Events - 18 and over $50 – includes timed finish, participants medal, high performance shirt and beverage and snacks from local sponsors after the run! 10km/5km Events - 17 and under $10 – includes timed finish, participants medal and beverage and snacks from local sponsors after the run! 3 Mile Walk -17 and under – entry is free and includes a participants medal and beverage and snacks from local sponsors after the run! All other Events - 18 and over $45 – includes the Rotary Brantford Classic Run T-shirt, a participants medal and beverage and snacks from local sponsors after the run! PLEASE COLLECT THOSE PLEDGES AND HELP OUT KIDS IN YOUR COMMUNITY! T-Shirts will also be available for sale in the registration tent on Saturday April 27th and on race day, Sunday April 28th. Please note that while the legend below states 2018, the route remains unchanged for 2019. $45 for each additional team member over 17 ($50 for 10km participants) and $25 for each additional runner 17 and under. Please note there will be a minimum team fee of $225. Entry fee includes a CUSTOM TEAM T-SHIRT PRINTED WITH YOUR TEAM LOGO OR COMPANY NAME for each team member, a participant’s medal, a beverage and snacks from local sponsors after the run! The Brantford Rotary Club would like to thank the sponsors who have generously contributed financial support, services and/or products to support the Brantford Classic Run. If you would like to become a sponsor, please contact Eric Sterne at esterne@hotmail.com for more information.